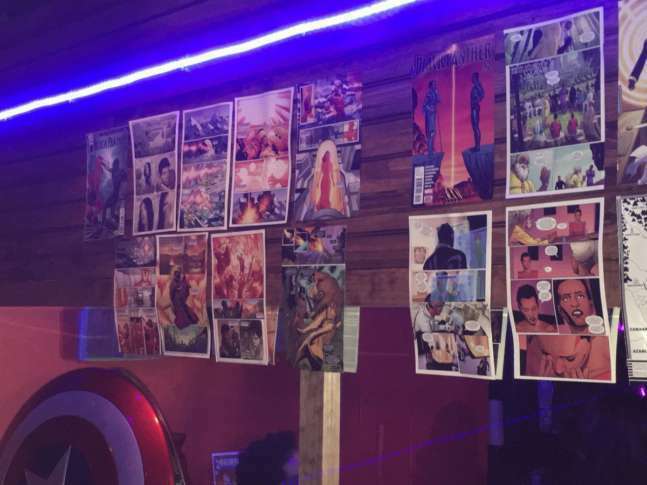 Folks in the D.C. area still have an opportunity to celebrate the newly released "Black Panther" movie with a trip to Wakanda — in the form of the Enter Wakanda pop-up bar. WAKANDA — Folks in the D.C. area still have an opportunity to celebrate the newly released “Black Panther” movie with a trip to Wakanda — in the form of a pop-up bar. Monday is the last day for Enter Wakanda at Red Lounge on 14th Street NW in D.C.’s U Street neighborhood. Tickets are staggered in two-hour entry blocks. According to the event’s website, the last entry group for this “Black Panther” pop-up experience is 10 p.m. Monday. Find tickets here. Things grew from there when more and more friends wanted to gather before watching the film. That’s when the idea emerged from his business partner, Greg Jackson, who Kelley described as a pop-up bar enthusiast. They ended up holding the holiday weekend event at Red Lounge, lining up with the movie’s opening weekend. “This entire production happened within the course of a month,” Kelley said. On Sunday afternoon, Red Lounge’s levels were packed with folks enjoying drinks and basking in inspiration from the film. “This is a picture that is representing black people in such a positive way. That’s super dope,” said one teacher, who stepped into Enter Wakanda with some of his colleagues from the Truesdell Education Campus in Northwest D.C. Most of the group had seen the movie, except one teacher who plans to take a group of students to see the film on Wednesday. While waiting to get inside the venue, Victoria Altenord said she loved the movie and thinks the pop-up bar is cool. She is also on the lookout for her romantic future. “I’m coming to Wakanda; I’m trying to find me a King T’Challa,” Altenord said, laughing.